Termites tend to be a neighborhood-wide problem – so if your neighbor has had termites, it’s time to find out if you’ve been affected as well. Don’t wait until you actually see a termite swarm to get an inspection or treatment. Termites’ main source of food is wood, and each year they cause more damage to homes than fires, floods, and wind combined. And termites are equal-opportunity destroyers – all homes in Connecticut, at all times of the year, are fair game. What happens during termite treatment? We start with a thorough termite inspection by a qualified techniccian. Unless the termites are actually coming from within your home, it is probable that your entire termite treatment will take place from the home’s exterior perimeter, but the damage will need to be inspected before making this judgment. First, we’ll dig a 3″ x 6″ trench against the foundation of your home, and apply material by rodding to a depth of at least 4′. Then we drill a hole through abutting concrete or tar every 12″, injecting material at a rate of 4 gallons per 10′. We also drill abutting concrete stoops every 12″, injecting material at a rate of 4 gallons per 10′. Our technicians will also inspect the inside of your home to see if interior treatment is required. Envirocare Pest Control will provide documentation of the identified termite locations for future record. Are the materials used in termite treatment dangerous? The safety of all pesticides depends how they’re used. In Connecticut, the product label is the law. The average amount of material to be applied to kill termites can range from 150 to 350 gallons. The products that all exterminators use are meant to be used at this rate. If your exterminator treats only a small area and calls the job done, they likely did not follow the label directions. Therefore, it’s extremely important that the termite extermination company you use is not only licensed and insured in Connecticut, but also has practical experience with all of the safety measures needed when treating a home for termites. Can my family remain at home during termite treatment? There is no need to leave your home during treatment. However, by state law, we must inspect the home after treatment, so please know that we will require full access to the basement or crawl both before and after the service. It may take up to 3 months for the termites to be completely gone, because we use newer, safer products that get carried back to the termite colony by individual termites. How much does your termite extermination service cost? 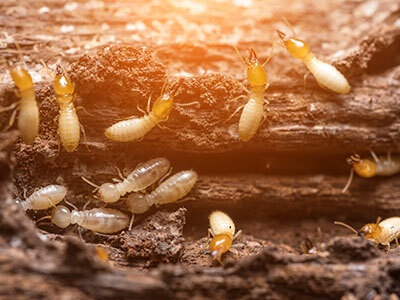 The cost of a termite treatment varies wildly in Connecticut because the pest control industry is filled with all different types of companies, from one-man operations to large national companies. In general, a thorough termite treatment is likely to cost in the range of $650–$1,500 depending on the size of your home and the complexity of the job. When comparing termite control companies, it’s important to look at all the charges involved. Some of the larger companies will charge a low fee for the first treatment, then a much higher fee to keep the product under warranty. This is important to know, as the long-range cost for the job could turn out to be entirely more than you planned on spending. All termite treatments from Envirocare Pest Control come with a 2-year warranty that is transferrable to new home owners at no additional charge. After this initial warranty, you have the option to extend the warranty each year for an additional fee. If you have termites and need a termite treatment, call Envirocare Pest Control at 888.879.6481. We can help.